Theodore Roosevelt was among his era’s most influential naval strategists, who thought about the overall planning for the U.S. Navy, its use as a military and diplomatic force, and the movement and disposition of the Navy’s assets. For decades, he strove tirelessly to transform the Navy into a highly capable instrument of an ambitious agenda to turn the U.S. into a great power. He made his first contribution as a young amateur historian in the early 1880s and continued to influence U.S. naval strategy right up to his death in 1919. As an undergraduate student at Harvard, Roosevelt started a serious study of the naval aspects of the War of 1812. He tirelessly pursued primary sources, including official papers and other original documents. He completed two chapters of what became The Naval War of 1812 while still at Harvard and finished the book in 1882 at age 24—in time for the 70th anniversary of the then-obscure war’s start. Prior to Roosevelt’s work, serious studies had pegged the cause of the conflict as the failed U.S. foreign policy designed to avoid war, particularly war with Great Britain. President Thomas Jefferson’s isolationist foreign policy had been lauded, and historians tended to ignore the naval operations and focus on the land war. Roosevelt’s ambitious book redirected scholarship about the war in several ways. He brought it prominence. He focused attention on the exploits of naval officers, most notably in frigate battles on the Atlantic and small boat heroics on the Great Lakes. Most importantly, Roosevelt started to articulate a theory that America’s greatness depended on the robust deployment of sea power. This vision caught the attention of Rear Admiral Stephen B. Luce and Captain Alfred T. Mahan, two important naval leaders and strategists whose own efforts would influence generations of diplomatic and military leaders. Luce, Mahan and Roosevelt quickly recognized their common cause and cooperated to promote a navalist ideology that saw America’s great power destiny in the establishment and use of a blue-water fleet capable of operating in deep ocean waters. As Assistant Secretary of the Navy in the feverish days following the sinking of the USS Maine in 1898, Roosevelt found opportunities to apply his theories. As acting secretary for only a few hours, he mobilized the navy for war with Spain. He ordered supplies and ammunition, sought support from Congress to recruit more sailors, and ordered the North Atlantic and Asiatic Squadrons to prepare for war. Roosevelt’s aggressive actions set in motion the machinery that soon would lead to the conquest of Cuba, Guam and the Philippines. By that time, Roosevelt himself had assembled the Rough Riders and joined the land war in Cuba. As president for nearly eight years, Roosevelt strove tirelessly to develop the navy as the “big stick” of an increasingly ambitious U.S. foreign policy. Working with Congress and the service itself, he increased the size, armament, amour, speed, efficiency, and overall capacity of the Navy and its vessels. The squadron system gave way to modern fleets, with coaling stations. Roosevelt deployed naval assets to cultivate American power, including in 1903, when he sent naval vessels to ensure that Panama would secede from Colombia—paving the way for the Panama Canal, which enabled the US Navy to concentrate its battle fleets quickly. Shortly thereafter, he earned a Nobel Peace Prize by successfully mediating the end of the Russo-Japanese War in 1905 at the Portsmouth Navy Yard with the deft support of key Navy assets. 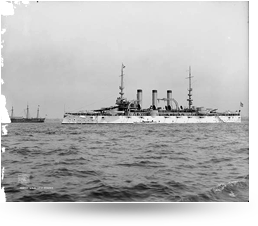 Roosevelt’s deployments culminated in the cruise of the Great White Fleet, 16 battleships of the Atlantic Fleet that sailed around the world between December 1907 and February 1909 —sending a clear signal that the US had global reach and ambitions. Roosevelt’s legacy as a naval strategist is linked closely to the rise of the U.S. as a great power. More than any other individual, he was responsible for creation of the modern, blue-water U.S. Navy and its deployments to promote an ambitious foreign policy—in the Caribbean, Asia and ultimately in Europe.